overall it seems to be a tight edit and closely modeled on CR's signature uniform. dark and monochrome, much in keeping with the moody, ever-so-femme fatale vibe. i'm not in need of any form-fitting skirts at the moment, but if you worked in a relatively corporate space and wanted to amp up the typical '9-to-5' look, these are excellent, versatile options with a bit of an edge. or you could just as easily pair the individual foundation outerwear pieces with existing staples and instantly add some swagger to your f/w rotation. have you scoped anything from the collection? any pieces on your list? Love the CR x Uniqlo collection! I'm surprised that not more of the pieces are sold out. 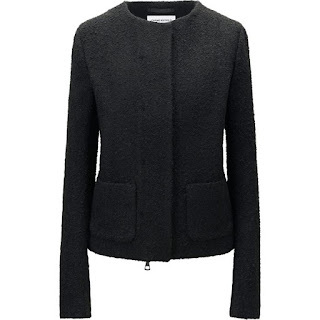 I've been eyeing the carine soft wool jacket and was wondering what the fit of the CR x Uniqlo collection is compared to Uniqlo's regular items? Unfortunately they don't have a Uniqlo in Canada and going to be buying the jacket online for my bf to bring back for me from the US. Thanks! I just bought the boucle jacket and have to warn that these pieces run SMALL compared to standard (United States) Uniqlo. I'm 5'4", 120 lbs, and usually I wear an XS in general Uniqlo. Even in the Ines de la Fressange line, I wore XS or S. But I had to buy this jacket in a medium! The small was very tight in the sleeves and across the chest (and I am not known for having a large chest, haha). Anyways, the coats are beautifully made and I'm excited to have a not-too-basic piece of workwear. Good luck! oooh that is very helpful, thank you! good to know that the quality is there too. Thank so much malbork! This was really helpful! I think I'm going to size up. Argh I was on the site at 11pm prior to official launch day, which I assumed would be midnight, but the faux leopard coat was already sold out :( I was so bummed. I heard she'll have at least one more season with them, though, so maybe there'll be a spring/summer version. 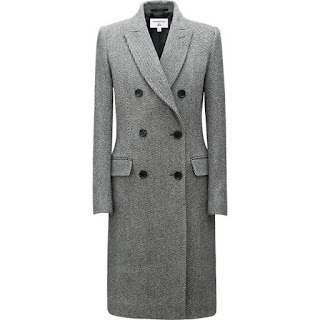 I was eyeing the soft wool jackets as well, but I really must.not.buy.any.more.black.jackets lol! i ordered a bunch of items online and am waiting for them to ship. luckily i checked around 9:30pm. the sale went live at 9pm per their twitter. i don't have energy to visit any of their stores, but given how lemaire went, i expect to see the pieces that sold out pop back into stores. i'm also hoping the chanelesque jacket to work. re: fit, it's supposed to be similar to their ines collection. their items' measurements are all in the sizing chart link but sometimes it's hard to visualize the fit. Beautiful chic pieces, but ehhh... nothing I "need." Uniqlo sizing tends not to work on me, and the coats/jacket look too heavy. I don't mean to make you feel bad -- but I stocked up on the Uniqlo + Lemaire collab and am very happy with all of the pieces (another commenter said she was disappointed in the quality, but I've actually found everything I got to be quite good for the price point). So no more collabs for me for awhile!